DAA Symposia bring together digital analytics, web analytics, marketing and business professionals for a day of learning, knowledge-sharing and networking. A collaboration between the DAA and our member-driven chapters, DAA Symposia combine world-class industry speakers with local digital analytics professionals in conversations that are both timely and forward-thinking, providing attendees with actionable insights they can implement immediately in their day-to-day role. These events provide a convenient, cost-effective opportunity to further your industry knowledge, as well as actively contribute your unique experiences and expertise within the analytics community. 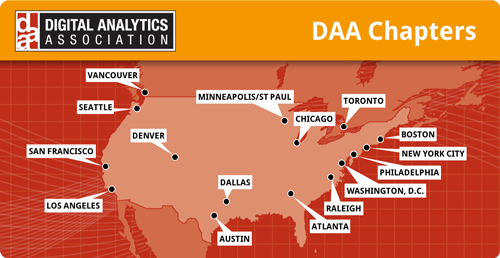 The DAA typically holds between 8-10 symposia per year, across our chapter locations. Please see below for the most up-to-date calendar of upcoming DAA Symposia. Interested in speaking at an upcoming symposium? We’d love to hear from you! Please complete our Content Submission Form for consideration. Interested in reaching digital analytics professionals and key decision-makers from hundreds of top global organizations? Consider sponsoring one or more of our symposia. Please download the Sponsorship Prospectus or contact Matt Dirks at matt@accessmarketing.com for more details. "Finding the Signal in Digital: Analytical Success Stories"
We've uploaded a number of clips from some great presentations at previous Symposia. These clips are available to members only.